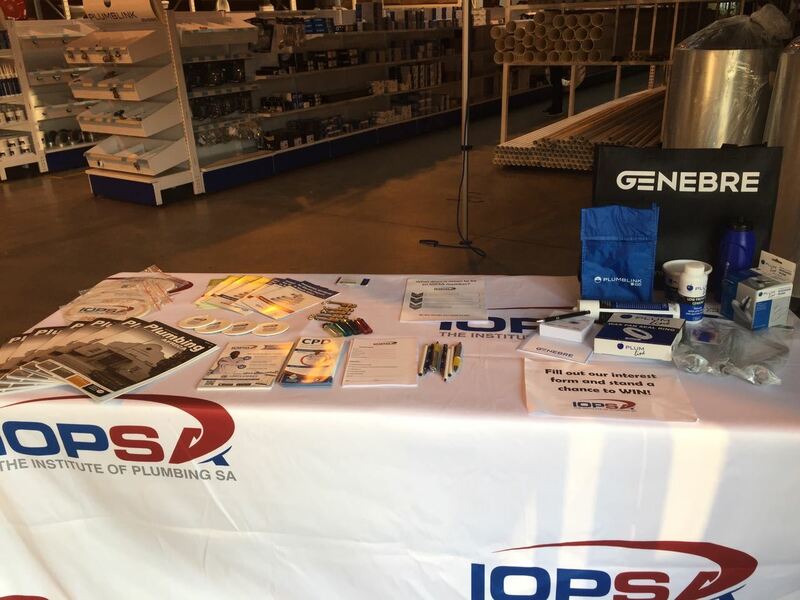 IOPSA Gauteng Merchant activation a SUCCESS! 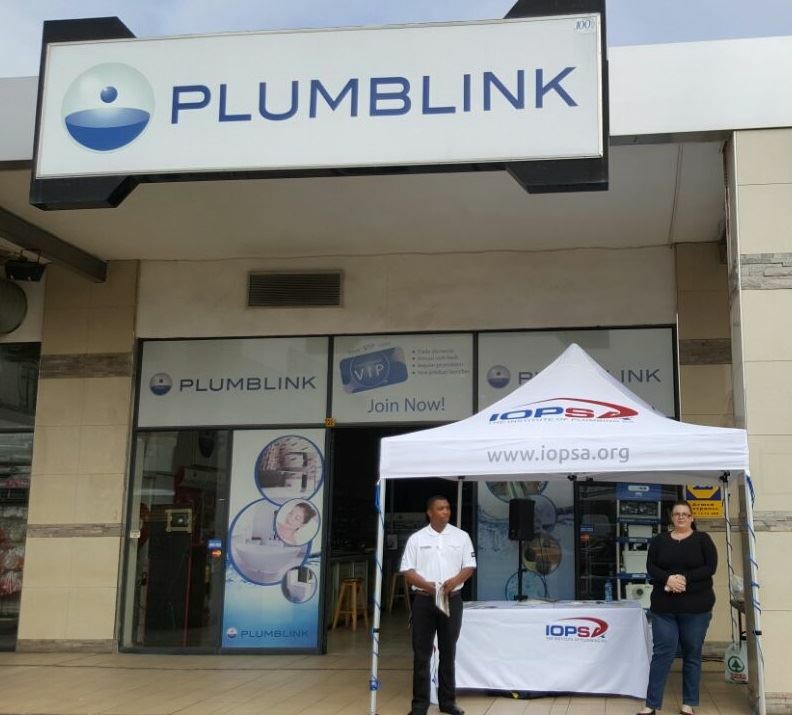 IOPSA, Plumblink Benoni, Plumblink Benrose (Gauteng) and Grohe Dawn Watertech joined together for Interesting Plumbers Morning(s). Business owners and staff joined for borewors rolls and got chance to speak with respective representatives. 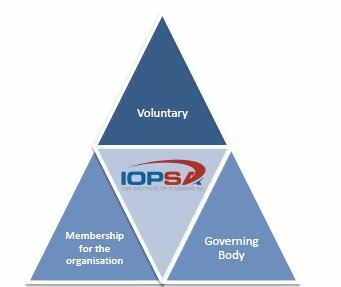 IOPSA are driving awareness in terms of Compliance, our online Job portal, Webinars to earn CPD points as well as providing support to current members. Look out for a Merchant Activation near YOU and stand a chance to win a Plumblink Hamper every month worth R500! Jacky Gewe (Grohe Dawn Watertech) and Kaela Bell (IOPSA National) ready for action. A wealth of Information at the ready. Sello Mokawane (IOPSA Gauteng) engaging with one of the many visitors. IOPSA has worked tirelessly to create awareness and accessibility to the knowledge of the SANS codes however we still see many cases where installations are not compliant due to common mistakes. Below we explain why an installation is non complaint and how to correct the mistake. 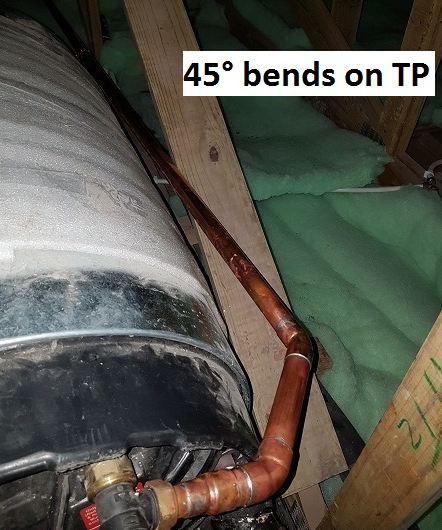 T&P Safety valve overflow pipe has been piped with the correct copper tubing but the incorrect bend has been used. 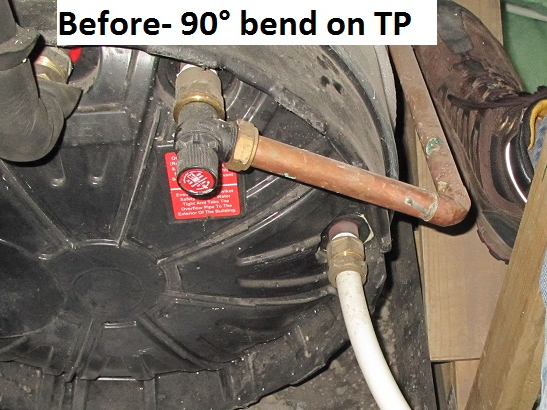 As per SANS 10254 the overflow pipe needs to be piped using 45 degree bends only. See extract from SANS 10254 along with the now compliant installation. inconvenience the building's occupants or cause damage to the building. What are the differences between IOPSA and PIRB? IOPSA provides an industry forum for plumbers, suppliers, manufacturers, professional specifiers and building & draining authorities. The Institute provides a platform to advise on the practice and principles of the plumbing industry. The Institute regularly consults and liaises with the plumbing industry, governmental and regulatory bodies for the discussion of matters affecting the plumbing industry. The PIRB proactively promotes quality workmanship by means of issuing a Plumbing Certificate of Compliance (CoC). This CoC may be issued by a Licenced Plumber – that is – a qualified plumber registered with the PIRB. Are you using the right sized pipe? 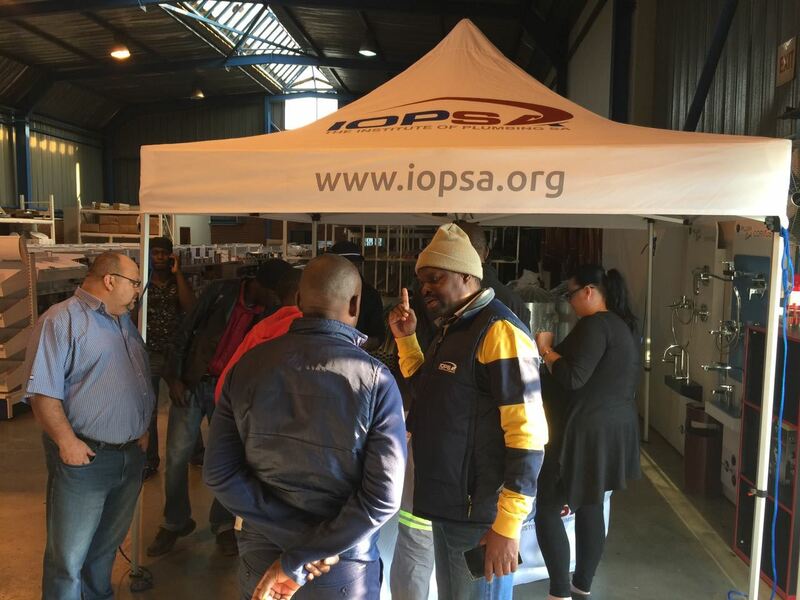 Over the past few months IOPSA have had to deal with complaints from across the country in terms of plumbing water reticulation systems that do not function correctly. In most cases these issues are only noticed once occupation has been achieved and the problems in terms of flow rate are then brought to the fore. In many cases rectification of the system is costly and as experienced in one such complaint legal action was taken. In many instances the design of the water reticulation system is left with the plumber who is not competent to design. SANS 10252-1 has very clear detail in terms of sizing of water reticulation systems which cover. Pipe sizing in terms of flow rates required for each terminal fitting. Ensure that you take these details into account when next you price a project or for that matter be up to speed In terms of being able to question drawings supplied to you. If you are unsure then seek guidance rather than assuming what is right is right and then finding yourself in a legal battle. The standards are there to assist us and if we follow and abide by them the system will function correctly. There are webinars available to assist with basic pipe design and these will add a great amount of value to you and your business. Cover the bases and yourself follow the rules. We are currently dealing with a few design complaints that may cost the contractor a great deal of money and in one case where the fire reticulation system failed due to incorrect pipe sizing and placed the complex and residents at risk. Reducing pipe sizes will reduce cost but ,will certainly increase your risk. With local authorities reducing pressures through their bulk mains due to the drought, even more reason to ensure that the system is designed correctly taking these reductions into account. Mark joins the IOPSA team as the National Technical Manager with over 11 years’ experience within the plumbing industry. Coming from a long line of family within the construction and plumbing industry Mark followed in his families’ footsteps. Before coming to IOPSA, Mark worked for MNK Projects where he worked as a site agent and plumbing department manager in the commercial development division. Mark is a qualified plumber and registered gas installer. Mark is responsible for technical reports, complaints, inspections and members’ technical assistance. He also sits on the SABS Committees on behalf of IOPSA, the IOPSA National Executive board as well as being a PIRB inspector. In his free time, Mark enjoys spending time with his family and 2 month old son. 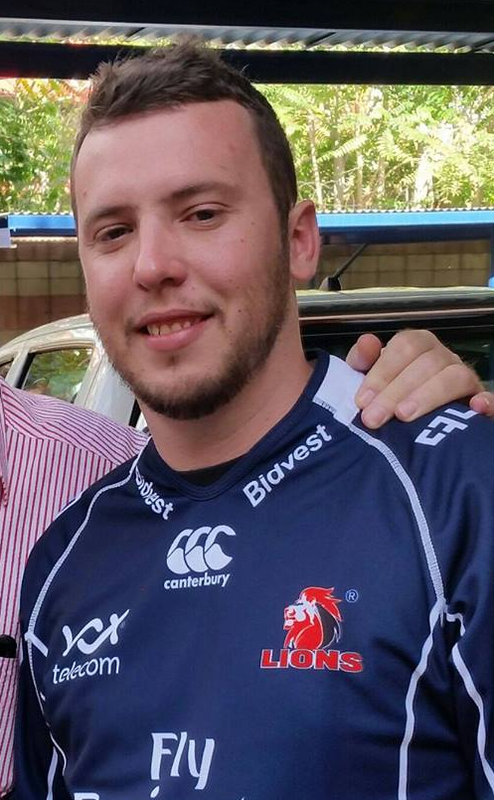 Mark is also a HUGE Lions Rugby team supporter. The Benefits of Working with Registered IOPSA Plumbers - Can You Afford Not to Use a Qualified Plumber? Every day 6,000 children die of water-related diseases. Waterborne disease is a worldwide leading killer. How to avoid tragedy and protect your family by understanding what causes, injury, health issues and even death in your home. Finding a reputable and credible plumber, who adheres to the regulations & bylaws can be an arduous and stressful process; often through trial and error – which is an expensive exercise. It is essential for plumbers to be reliable, efficient and to deliver. The Institute of Plumbing South Africa (IOPSA) is a voluntary national body that provides a platform for qualified accredited plumbers. They advise on the practice and principles within the plumbing industry and regularly consult and liaise with governmental and regulatory bodies on matters affecting the plumbing industry. IOPSA members employ professional plumbers registered with the Plumbing Industry Registration Board (PIRB) and are experts in their field, having met IOPSA requirements. The fact is, it is law that any person working on any plumbing within your property must be trained (as a qualified plumber), or work under the adequate supervision of a trained plumber. An unqualified individual practising plumbing is doing so unlawfully. Typical problems that arise when using unqualified plumbers can include leaks, bad smells from drains and pipes, flooding, damp, mould and poor water pressure. Other more serious issues can include contamination of clean drinking water, the breeding of disease, scalding and burns, and even explosions. Using an unqualified plumber can lead to additional costs to find the problem, fix it, repair the damage, and replace finishes; it may even lead to injury or even death. Using IOPSA plumbing companies gives a consumer peace of mind, technical support, rates guidelines and most importantly recourse. IOPSA members ensure accountability, quality service, required insurances, community growth and reliable results. So if you as a consumer believe that a member has not delivered a service or product agreed upon, then you can approach IOPSA to intervene and facilitate a suitable solution. IOPSA also supports the development of individuals to become qualified plumbers and entrepreneurs. IOPSA encourages consumers to make use of their online platform to find a local IOPSA member for their next plumbing endeavour. For more information or a list of qualified accredited plumbing companies in your area visit our website. www.iopsa.org.za or contact Kaela on 08610 PLUMBER (75862). “Qualified plumbers reduce the risk of poor sanitation and disease more than any other trade in the world.” Quoted by IOPSA executive director Gary Macnamara. The Institute of Plumbing South Africa (IOPSA) sets out to achieve the best for the plumbing industry, and strives to share the rules and regulations in a simplified and straightforward manner. responsibility and the person will have an extensive knowledge in this field. 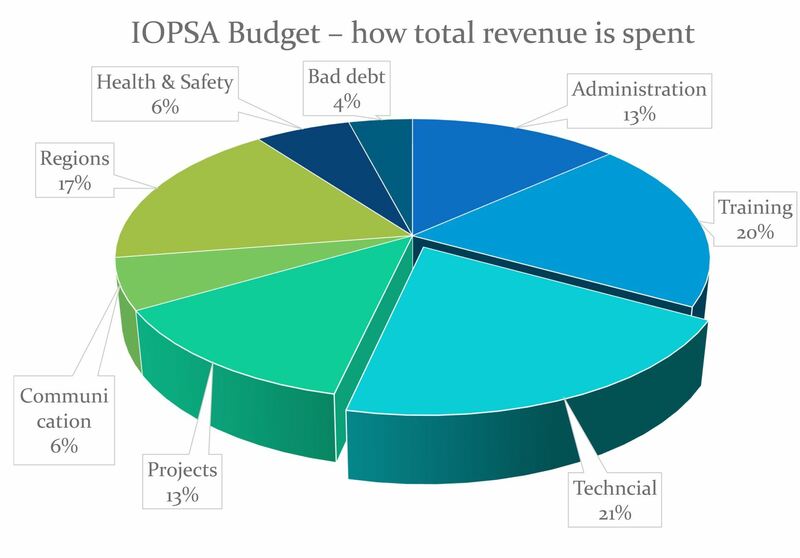 With an in-house Health and Safety Office, IOPSA will be able to provide occupational health and safety training and advice to members. FEM was established as a mutual insurer in 1936 and, on the introduction of the Workmen's Compensation Act 1941, was granted a licence to continue to transact workmen's compensation insurance for the building industry. Its business operations are essentially confined to the insurance of employers against their liabilities under the Compensation for Occupational Injuries and Diseases Act 1993. IOPSA hopes that with this valued Grant from FEM, having an expert in the field will alleviate some of the frustrations caused by the lack of knowledge on health and safety. “The presence of having a specialist working with IOPSA, we believe, will improve the industry tremendously and assist with one-on-one as well as one-to-many communication. In time, the plumbing industry will benefit organically,” enthuses Gary Macnamara from IOPSA. There have been a number of changes that have been made to the areas of compliance related to SANS 10254; the installation, replacement and maintenance of a geyser as at 2001 when SANS 10254 became a regulation & amendments to safety in 2004. These changes have often resulted in confusion and misinterpretation of this specific regulation. 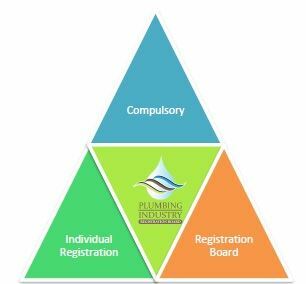 To help reduce non-compliance within the plumbing industry, The Institute of Plumbing SA (IOPSA), in association with the Plumbing Industry Registration Board (PIRB), has broken down and simplified the critical areas of the regulation to ensure that the standard can be easily understood. 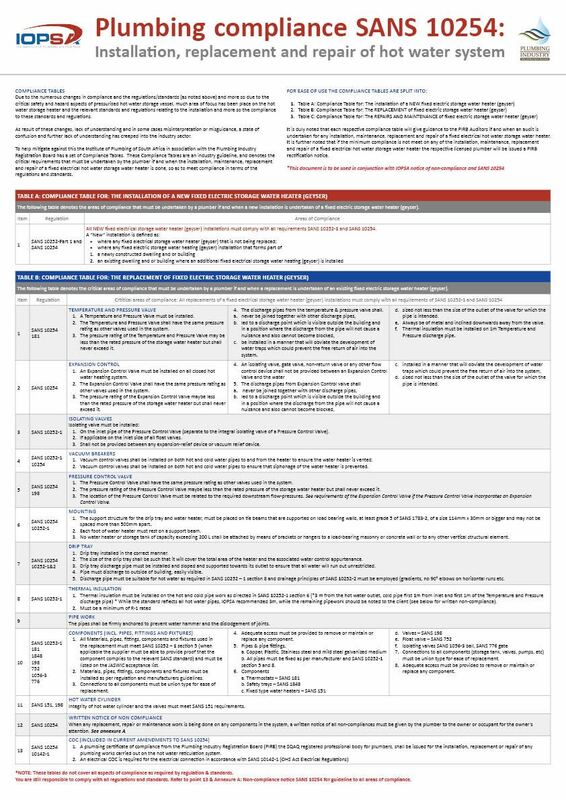 This is freely available on the IOPSA website and has been designed to alleviate some of the confusion that could result in safety hazards as it provides a practical guideline in the form of a compliance table. 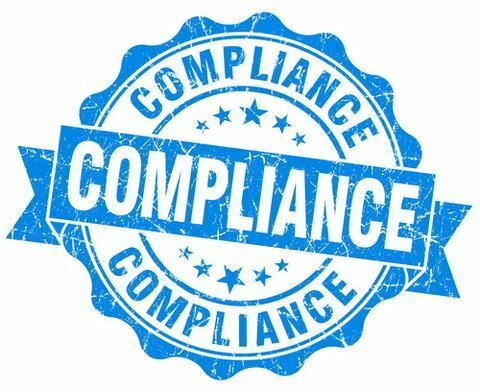 Compliance to SANS 10254 affects all manufactures, suppliers, merchants, retailers, installers & the entire value chain. The compliance table will give guidance to the PIRB Auditors, when an audit is undertaken, to cover all the above sections. It is further noted that if the minimum compliance is not met on any of the installation, replacement or repair, the licensed plumber will be issued a PIRB rectification notice. The critical compliance table must be read in conjunction with SANS 10254 and the IOPSA notice of non-compliance that specifies all areas of compliance. It is further noted that as required by the regulation an installer must issue the building owner with a notice of non-compliance, if any existing items do not meet the regulations. Taking into consideration the lack of competent skills within the plumbing industry, the Institute of Plumbing South Africa (IOPSA) has created an online portal for members to facilitate access to specific competent skills within the sector. The purpose of this portal is to both help applicants to find jobs, and aid employers in their quest to locate ideal candidates. The IOPSA job portal offers a broad range of jobs in the plumbing field, for every sector within the industry; providing a scope for junior and senior roles and individuals with a variety of qualifications and skills. Employers on the portal can post an available job position on the job portal, providing a detailed description of the job. Employers are also given the option of finding a C.V within the C.V search, to find the right candidate for the job. The intuitive search function enables employers to search for candidates whose CVs have been uploaded. The portal allows job seekers to explore the vacancy opportunities on the portal, using keywords to match their desired title, with the option of selecting the area in which they are looking to work. Should a job on the portal matching this description be available, the applicant will be able to apply online immediately. If a job seeker is looking for a specific company to work for, the portal offers a list of selected companies that, when clicked, will show the available positions inside that company. Within the portal is a function to upload CVs for potential employers to peruse. The availability of a C.V on the portal will increase the chance of being contacted for a job. The IOPSA job portal has been designed to support the industry and its members to find employment and the right employees for the positions available. It is the first specialised online job portal tool for the plumbing industry. The portal is a means to connect job seekers with potential employers. If you, as an employer, would like to list your company, contact Kaela on 011 454 0025, or email her on info@iopsa.org.